TabletTail Lynx Universal iPad & Tablet Stand | Nerd Much? 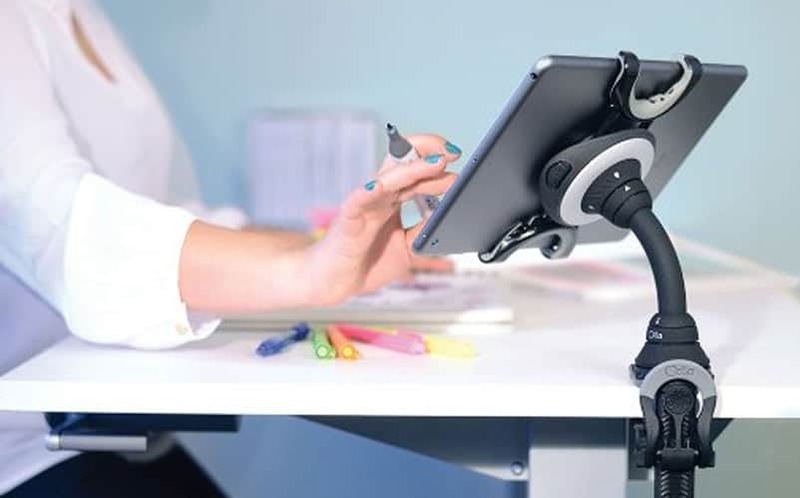 If you typically have your iPad or tablet next to you while you’re browsing on your desktop PC, or if you use it to watch TV or listen to music while doing other things at your desk, you might be interested in the TabletTail Lynx Universal iPad & tablet stand. This uniquely designed stand clamps to any surface that’s 2″ thick or less, whether it’s flat, round or irregular. It’ll can be clipped to bathtubs, tables, desks, counters, tripods and more, making it pretty much as versatile as you are. The stand is universal, and although it’s advertised mostly as an iPad stand, it works just as well with other tablets. You can clamp it to exercise machines, entertainment centers, and virtually anywhere else you would like to have an added screen. You can use it in the kitchen while looking at a recipe, at your PC while looking up Minecraft tips while you’re playing, or to watch Rick and Morty on your tablet while crafting your own inventions in the garage. Stay tuned to Nerd Much for more cool stuff to buy that you don’t need.